Gerard O’Neill is often looked to as one of the greatest pioneers in the world of orbital settlement. His books and lectures made what many considered a sci-fi pipedream seem realistic and attainable. His book – The High Frontier – is seen by many as one of the best, most readable books on the subject, even decades after its publication. His life’s work led to the formation of the L5 Society, as well as inspired works by the National Space Society (NSS) and several other major space groups. He was also one of the first people to popularize designs for space colonies backed by scientific research. O’Neill envisioned three designs for his space colonies, which he referred to as the “Island Three” throughout his writings: the Stanford Torus, the Bernal Sphere, and the O’Neill Cylinder. Each of these structures is fairly different and has a variety of mechanical and technological hurdles standing in the way of their construction, outside of the obvious prohibitive costs associated with constructing a city in the stars. Stanford Torus settlement (Credits: Don Davis/NASA Ames). The Stanford Torus was considered by O’Neill to be the most basic of his three main designs. 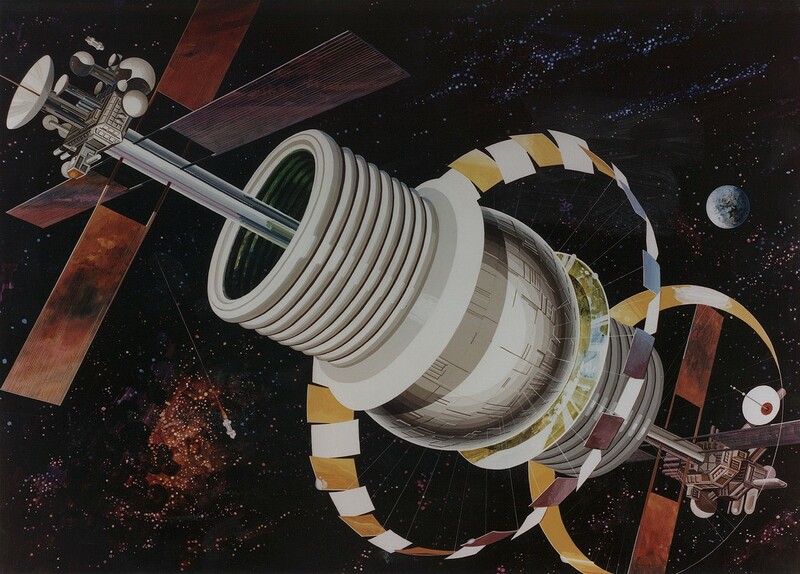 Based on the idea of a ring-shaped rotating space station originally put forward by Werner Von Braun, the Torus was designed in 1975 by O’Neill to be a small, feasible settlement in space as part of a summer research project that would go on to become the basis of a paper on space colonization. The design consists of a doughnut shaped habitat about a mile (1.6 km) across, with a large mirror suspended above. The mirror reflects sunlight through a series of secondary mirrors arranged in such a way as to block harmful rays from the sun, while still providing power and light to the station. The paper stated that the station could hold around 10,000 people eventually, housed in the center of the ring. The outer layers of the ring were to be used for shielding, and the inner for agriculture. The ring would have to spin once a minute to produce Earth gravity, would generate power via solar arrays and have a small non-spinning portion designed for zero gravity work. Inside the station, O’Neill envisioned colonists living a leisurely life, with ample space and every amenity on Earth, but with all the benefits and splendor afforded to them by the cosmos. These relatively scalable Torus structures were designed to be suitable for anything from a small Earth-orbit rest stop to self-contained cities at Sun-Earth Lagrangian point L5. Some effort was even put forward to describe how this structure would be built mechanically. Construction and fabrication would be very much like Earth construction, utilizing standard methods of building. The fabrication of raw materials would require special forges designed for space and imported ores from the lunar surface (an idea later found to be prohibitively expensive as a first step and replaced with the concept of asteroid mining). Bernal Sphere settlement (Credits: Rick Guidine/NASA Ames). Originally designed by British scientist John Desmond Bernal, the first Bernal sphere was a vast 10 miles wide, filled with air, and housing over 20,000 people. O’Neill redesigned the station for a project at Stanford, scaling down to only 500m rotating at 1.9RPM to produce near-Earth gravity. 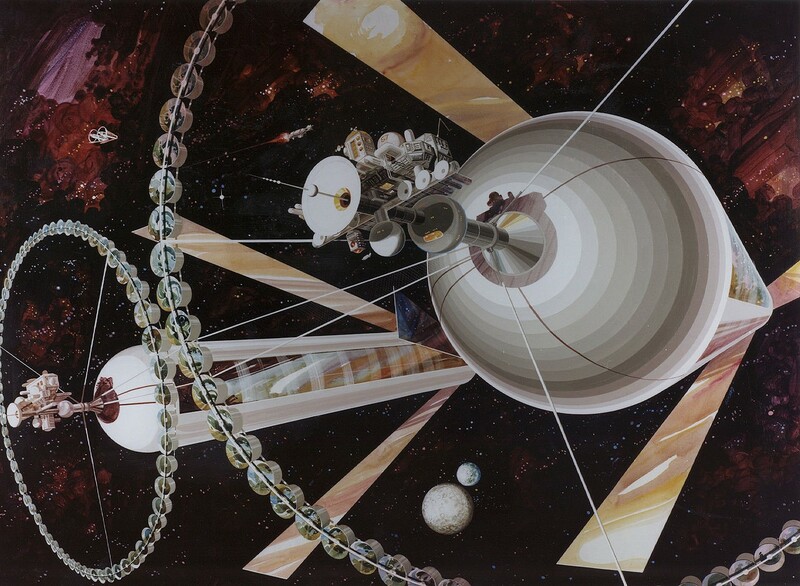 The Bernal Sphere was put forward as a concept for ”next generation” space stations designed for comfort, over more utilitarian stations such as the International Space Station (ISS) or the Torus. Similar in many ways to the Torus, Island Two would rotate to produce gravity, collect sunlight via a series of mirrors and contain a series of farm sections producing food for the population. The spherical design of Island Two meant that the need for a special zero-gravity compartment was not needed; the center of the station would be a zero-gee zone and could be utilized for specialty fabrication or recreation. 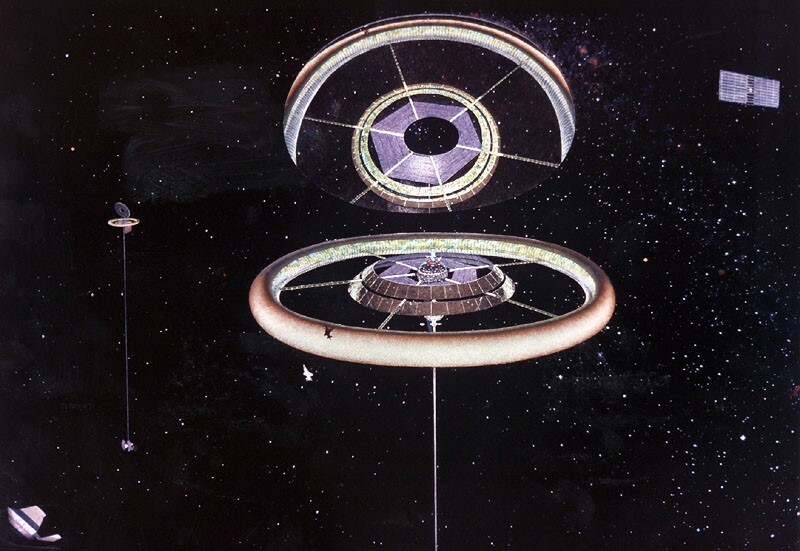 The habitat was designed with several rings at both ends of the sphere to be used for farming, and a long docking tube running through the entire structure capped with microwave communication arrays and solar collectors. Much of the research and study that went into the Torus design was also applicable to the Bernal Sphere. Its construction would require a similar building approach, its shielding methods and internal construction would also be similar. The L5 Society hoped that such a structure would take only 2 years to build, based on their (clearly) massively optimistic timeline of space industry development. Island Two was later presented by the L5 Society as the model of their hopes and dreams – the idea of a massive verdant valley in Space, teaming with life and housing thousands would, they hoped, capture the imagination of the world. O’Neill Cylinder settlement (Credits: Rick Guidice/NASA Ames). Island Three was proposed as a sort of end-game design for space habitation. Published by O’Neill in 1974 in Physics Today, the cylinders were essentially the ideas of the previous designs writ large. 5 miles (8 km) in diameter and 20 miles (32 km) long, two cylinders would hold upwards of 40,000 people each comfortably, with great spaces devoted to parks and greenery. In contrast to the earlier designs, these would be veritable cities built in space; citizens would be workers from all walks of space industry and their families. The cylinders would not merely be a place for workers to stay during their contracts, but a true home, full of recreational facilities, businesses, and industry. The size of these habitats provides several quirks – for one, they would require a relatively slow rotation to maintain near-Earth gravity (only about 40 per hour). This would be slow enough to avoid causing motion sickness in almost everyone living aboard – although citizens would be able to detect spin by turning their heads quickly, or by watching the arcs of items dropped or thrown. The size of the colony would also provide a great deal of radiation shielding via its atmosphere and thick glass walls – indeed, the internal size of the colony would be so great that it would produce its own weather systems. The issue of sunlight is solved with the now-familiar application of giant mirrors, which could turn to simulate day and night, with large bays of solar collectors powering the station. The one major issue with the design was that the stations would need to be constantly pointed toward the sun for habitation to be possible. Conventionally, attitude adjustment is made with rockets or other chemical methods, but the mass required for constant stationkeeping adjustments would be impractical. O’Neill and his students designed a complex system of counter-rotations involving a second cylinder that would keep both cylinders pointed in the right direction without the use of rockets. The O’Neill designs inspired thousands. The L5 Society and by proxy many other space groups grew from the research he and his students conducted, and a whole movement dedicated to seeing human colonization of space arose. It was one of the first times that the concept had been pushed so hard, not only amongst scientists and space agencies, but toward the general public as well. The research was extensive and the science and work behind the concepts was sound, but importantly the PR and public outreach was equally extensive. The original summer study paper discussed everything from population distribution to deep space research. It is a fascinating read that provides a wide range of sensible, feasible ideas as well as justifications for the construction of a large scale habitat. The stations are not without their flaws. The designs do not allow for natural sunlight, requiring a great set up of prisms and mirrors to reflect sunlight into the structure. Many of the designs are overly complex in their layout and there are several areas which the advancement of our understanding of space could lead to a great deal of improvement. Safety concerns are one of the foremost problems plaguing these structures. Failure of the rotational mechanisms could very quickly lead to a catastrophic failure of the habitat itself. The reliance on rotation to produce gravity would require a great deal of maintenance and the counter-rotation design of the O’Neill cylinder seems vulnerable to all manner of issues. Furthermore, several unknowns discussed in this article series hinder these designs – radiation, micro impacts, and asteroids are still unexplored areas aside from a scant few experiments outside of Earth’s atmosphere, to say nothing of the issue inherent in maintaining the atmospheres and large scale farming that each design requires. While the actual construction of these frontier towns may be a relatively simple affair in the grand scheme of things, the material requirements and large scale infrastructure required by any of these projects is immense, and our current space-industry level is nowhere near the scale required for such an undertaking. O’Neill first suggested moon bases and rail-guns to transport materials to building sites; this idea was later supplanted with the asteroid mining concept utilized by most experts in the subject to date. The fact remains that regardless of where the materials come from, we have a long road ahead of us to achieve O’Neill’s vision and that of the generation he inspired. Next time on Living In Space, we take a look at where Space Colonization is now, what designs have come since the 70s and ask, is humanity ready to leave its cradle? Although, technically the idea was floated by many scientists before Von Braun. Notably the Soviet scientist Konstantin Tsiolkovsky suggested rotation to produce gravity in the early 1900s. Slovenian scientist Herman Potocnik even constructed a working model of the design. Although a later study would show that the mirrors would not work quite as intended and would have to be reworked. Good to see we are still moving forward after 40 years of (my) hoping.